David Gemmell used to be my favorite writer and several years ago I spent many hours reading his novels. In fact I have all of them until today. Sadly, he passed away while writing the last book of Troy trilogy. His wife stepped up and completed the story using his notes. It worked really well and Troy: Fall of Kings was well received. 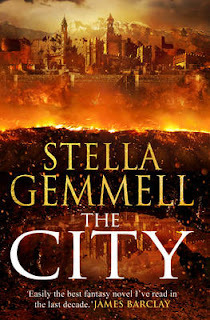 "The City" is her first independently written book, and it has received mixed reviews. I found it disappointing. Using the city itself as the main protagonist is an interesting solution. After years of wars and conflicts, it has expanded way beyond its borders. Now it's so huge that its inhabitants sometimes don't even know what life beyond it looks like. The city is ruled by the emperor, an ancient god-like character who is rarely seen by other people. The story begins in the sewers below the city, where some of the protagonists are presented. As the narrative progresses, other characters are introduced and gradually higher layers of society are presented. I felt that each time a character was introduced and I started identifying with them, the action suddenly switched to another one. I didn't like this solution as I never felt that the potential of protagonists was fully explored. Also, their behavior was not only surprising but at times even erratic. I finished the novel mainly out of respect for David Gemmell but found it disappointing on many levels and probably won't even read the continuation.